Why Am I Sore After Push-Ups? Arms sore after pushups? You're probably experiencing DOMS, otherwise known as delayed-muscle onset soreness. While any condition with its own acronym tends to sound scary, DOMS is a normal response to exercise, particularly when you're embarking on a new workout regimen. DOMS can occur 24 to 48 hours after a workout, especially when you've activated muscles that haven't been worked for awhile — or ever. The symptoms of DOMS can range from mild to severe. You may feel a virtuous soreness that inspires you to do more, or you may have the kind of deep soreness that you normally associate with the flu. Delayed-onset muscles soreness is normal after a tough workout. After pushups, you may experience sore muscles in your arms, upper back and chest. 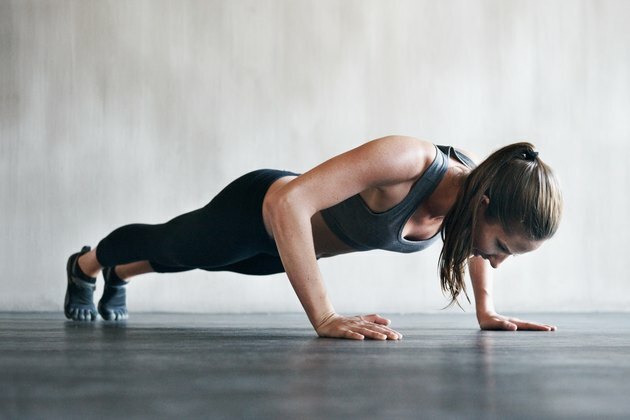 Any kind of intense exercise can bring on DOMS, and pushups have several things going for them in the "no pain, no gain" department. For building upper-body strength and working your core, they might be as close to one-stop shopping as you can get. Not only do they activate the muscle groups in the chest, arms, shoulders, triceps, back and neck, but they also can strengthen core muscles like the transverse abdominus. That can add up to what seems like full-body soreness. Exercise may bring on DOMS in several different ways. There's no consensus on the exact mechanisms, but the suspects include muscle spasm, connective tissue damage, muscle damage, inflammation and out-of-whack enzymes. But really it's all about the body's repair and rebuild process. At the end of the day, sore muscles are caused by microscopic tears inflicted during exercise. Swelling causes discomfort, but it's part of the "what doesn't kill you makes you stronger" deal. So with all of the muscles that pushups activate, it's no surprise that soreness occurs. You can't really speed up your recovery but you can relieve the symptoms, which should begin to progressively subside after 72 hours. Arm soreness after pushups is common as is soreness from the neck to the lower back, and everywhere in between. For particularly tender spots, applying an ice pack may be helpful. Gentle stretching, massage and non-steroidal anti-inflammatory drugs like aspirin, ibuprofen or naproxen may also help matters. Keep in mind, though, that for any of these approaches to work, they need to be applied almost immediately after working out. DOMS is easier to avoid, or at least mitigate, than to treat, and an ounce of prevention is worth a pound of cure. First off, know your limits. Rome wasn't built in a day and your chiseled new physique won't be either. So build up your number of reps gradually. As with any other exercise, warming up can work wonders in preventing post-exercise soreness. For pushups, try sun salutes as practiced in yoga. Add to that shoulder rolls, arm circles and torso and wrist rotations. While muscle soreness is normal, chest pain after pushups may be the sign of an injury or more serious condition. If you experience pain during your workout, consult your doctor.